If you spend some time developing Windows Store apps, you will notice that item templates play a major role since we have to use them to display data in many controls (most used ones are GridView and ListView). They give us total control over how we should present information to user, and if designed right, they can single-handedly make our app quite beautiful. However, as you progress, you will also notice that sometimes just creating an item template is not enough: You may need to customize them based on the data you have. For this purpose, we can do several things that I’ve mentioned in my blog, such as using IValueConverter to bind your data to nearly every property, or creating a custom user control and using it in the item template. Still, however, if the amount of customization you need to do in the item template is way too much, you can instead decide to create several different item templates, and then use them at the same time via the DataTemplateSelector interface. 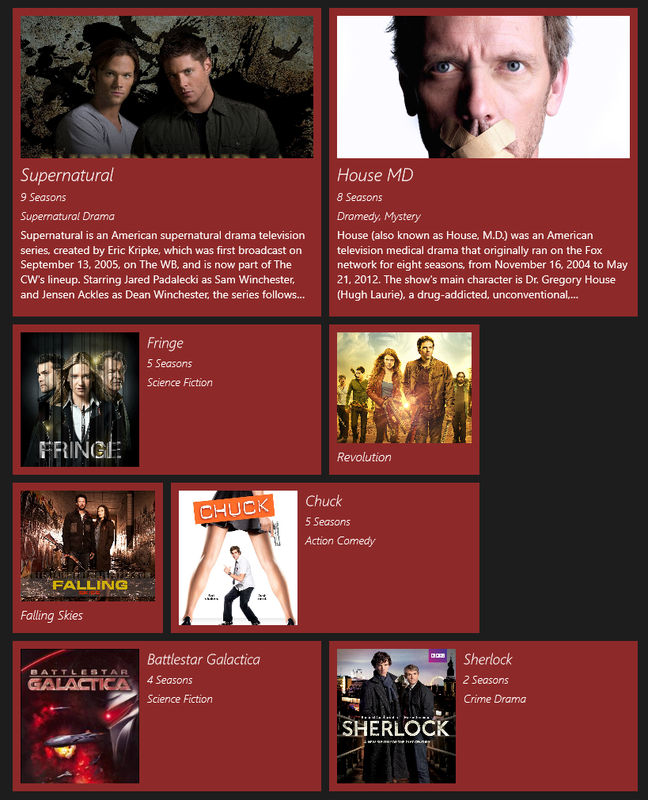 Screenshot from the example app we will create. 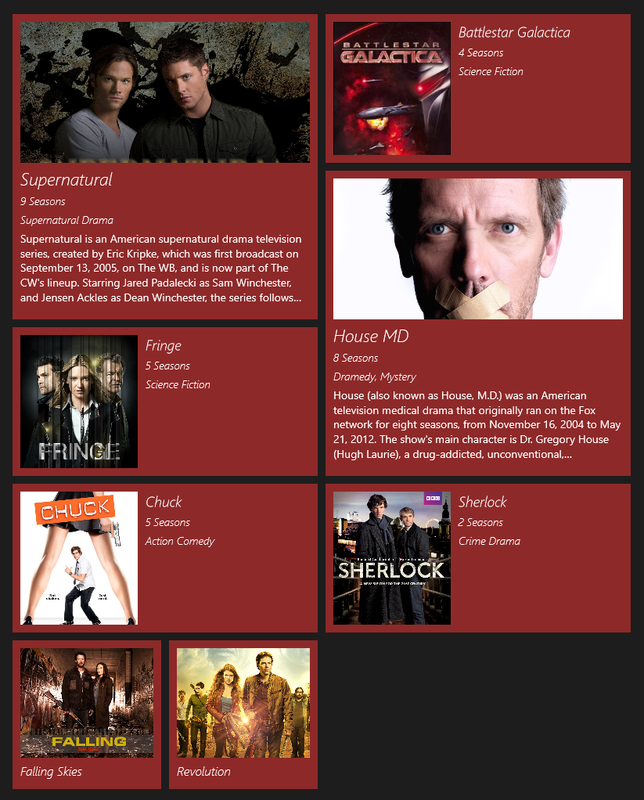 We make our humble beginning by creating a blank Windows Store app in Visual Studio. 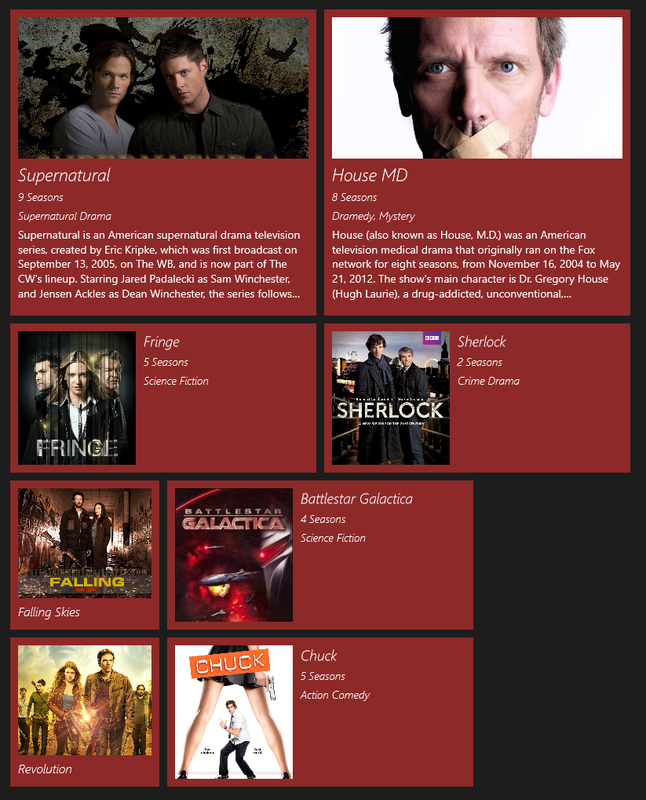 Our app will display a list of TV series, which will have differently sized item templates as seen in the screenshot above. 1) If the sizes of your item templates won’t change, you can just directly jump to the part where we define our template selector. Here, we read our TVSeries object and then change the RowSpan and ColumnSpan properties of the ItemsPanel template our custom GridView will have, which will create our item in the size we desire. Let me explain a little more. You’ll understand it better when you see how it works in the example. Notice that we’ve added a reference to our project at first, with “xmlns:common=”using:TemplateSelectorApp”. Then we’ve defined which templates the template selector should use, and finally also defined our VariableSizedGridView to use the template selector. The VariableSizedWrapGrid in the ItemsPanelTemplate will allow us to create our items with the correct sizes. You can get the source code of the example here. I have a requirement where I need to bind 3 different models to the same results grid view based on search criteria. The headers also need to be changed as the models have different properties. What would you suggest would be best approach to this?